In this article, both devoted martial artists were queried as to their views on the difference between sport and traditional taekwondo, the importance of poomsae, training in Korea, and sought their opinions on the future direction of taekwondo. Here are more questions from the interview with Grandmaster Richard Chun and Master Doug Cook. What are your views on the current state of taekwondo? GMRC: I feel taekwondo should first and foremost be emphasized as a martial art since the goal of any classical martial discipline is self-defense and character development. If taught correctly, uncorrupted by uncontrolled personal gain or technical ignorance, taekwondo is certain to build strong moral qualities such as humility, respect and courage. This is what separates a martial art from other fighting systems. While I am glad to see the success of taekwondo as a competition entity, all aspects of the sport should have their foundation deeply rooted in the martial art. Do you have any hope that taekwondo will remain a martial art rather than simply evolve into a combat sport? GMRC: This is an interesting question. You see, becoming a competent competitor in taekwondo is different than training for other sports. In baseball for instance, you do not need ranking to qualify for a team; you simply must be very good. However, in taekwondo, the practitioner must first earn color belts and then advance to black belt before they can qualify for Olympic participation. If you think of it this way, they almost cannot avoid training in the martial art first. So, I think the martial art of taekwondo will always survive since it is a road to Olympic gold. MDC: In my view, it has been said, time and time again, here in this magazine and in other forums, that if traditional taekwondo is to be preserved, it will likely be accomplished outside the borders of Korea. Frankly, I have met many master instructors while training in Korea who have vowed to promote the traditional, defense-oriented aspects of the art, but it is here in dojangs under the auspices of the USTA and other similar organizations, that the "do" or "way" of taekwondo is being maintained. How do you define "traditional taekwondo?" MDC: Traditional taekwondo is clearly different from combat sport. In traditional taekwondo we train the way martial artists did before triumph in the ring at all costs was emphasized. As a central focus, the practice of the classic poomsae is paramount, followed by ritual self-defense drills and close attention to character development using meditation, ki exercises and the governing principles of taekwondo as a vehicle. Master Cook, in your opinion, what has been lost in the art over the years and should still be practiced by the majority today? MDC: For the most part I would say a sense of purpose and intent beyond competition. While, as we have mentioned, taekwondo has clearly evolved into a popular combat sport with rules, regulations and limited technique, it still remains a classical martial art. When practicing poomsae, one-step sparring and self-defense, the student needs to express the intent to triumph through, if you will, a warrior attitude, causing the opponent's ki to flicker through a strong, ocular expression. For many, this statement will reek of metaphysics, but traditional taekwondo is as much about the mind as it is about the body. Cultivating the skill to be mentally victorious against adversity, in whatever form it takes, represents just one of the justifications for years of vigorous training. How important is poomsae, hyung and tuls, and do you feel they are relevant in modern taekwondo? GMRC: Formal exercises are the foundation of the martial arts. Form training teaches coordination, patience and a sense of the applications within the fighting patterns. Since forms teach you to respond to attacks from different directions, you develop an awareness of the enemy around you. They also play a big part in competition; both when competing exclusively in poomsae and when sparring where footwork and focus are essential. Forms training will always be relevant as long as there is a martial art of taekwondo. Can you tell us something about the United States Taekwondo Association (USTA)? What poomsae are required by the USTA? GMRC: The USTA requires the same poomsae as does the Kukkiwon for promotion test. We follow the same guidelines. 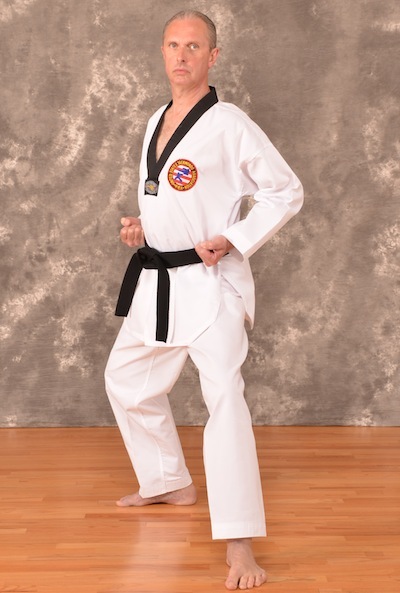 However, I do teach other forms that I learned during my time at the Moo Duk Kwan, especially to my senior students. MDC: To expand on Kwanjangnim's comments, as a United States Taekwondo Association affiliate school, we at Chosun perform the eight Taegeuk and eight Palgwe set of poomsae, in conjunction with the traditional Moo Duk Kwan and required Kukkiwon Yudanja forms. Grandmaster Chun has also gifted us with the five Kibon patterns and, perhaps most importantly, the original version of poomsae Koryo which we consider an heirloom poomsae. Master Cook, you have been hosting training and cultural tours to Korea for many years now. Why do you feel it is important to train in Korea? MDC: I believe you must experience Korean culture firsthand in order to fully understand the roots of taekwondo. In so doing, the practitioner can make a geographical and historical connection with their physical training. Visiting and training at the Kukkiwon, the various dojangs and universities, meeting the many gifted masters and students of the art, adds color and meaning to your practice that can only be appreciated by traveling to the homeland of taekwondo. The training there, especially at the university level, often focuses on sparring and the drills unique to that practice. To balance this, we travel to outlying dojangs and to Kyongju, the ancient capital of Silla, where we visit ancient Buddhist temples and the training grounds of the Hwarang. There, we practice basics, poomsae, meditation and qigong. Naturally, we reserve time for cultural pursuits and sightseeing as well. We are fortunate beyond measure to be accompanied by Grandmaster Chun since doors that typically remain closed to Westerners, open wide in his presence. We are actively planning our seventh training and cultural tour slated for July 2014. Each of you is credited with authoring multiple, best-selling books and DVDs focusing on taekwondo. How does this process coincide with the physical component of the art? GMRC: Physical training comes first since taekwondo is an action philosophy. Then, based on your physical training, you gain experience and you will learn the steps of progress. As you advance, you need to do research, read books, speak to other masters and benefit from their experiences. All this will help when it is appropriate to contribute editorially. MDC: I have always felt that it is not enough to address the physical portion of our art; you must contribute academically as well. Personally, the inspiration for my books has been drawn from great masters such as Grandmaster Chun, Sang Kyu Shim, Hee Il Cho, Son Duk Sung, Henry Cho and Yeon Hee Park, who have demonstrated a deep devotion to taekwondo through their literary skills. In reading their work, and that of many others, it quickly became apparent that taekwondo was not merely a series of physical techniques, but a road to enlightenment. Realizing this, I too felt a responsibility to express my passion for the martial arts through the written word. As odd as it may sound, once I begin a project, I almost feel that an external force is guiding me and using me as a conduit to disseminate this knowledge. We understand that you have collaborated on a new book and DVD, recently released. Can you share some information with our readers about this project? GMRC: The Korea Taekwondo Association long ago created a poomsae called Koryo. Then, the poomsae committee later determined that this form was too simple. Following deliberations, some of the committee members insisted that it be altered, partially to reflect the growing technical capabilities of the art. Some, however, claim that the decision was politically motivated based on dissention between the kwans or institutes that existed at the time. Since only three or four of the kwanjangnims were responsible for the creation of the original Koryo, others felt that it should be changed based on their input so the current version was developed. Still some of the committee members felt the original Koryo was a good poomsae and wanted to maintain it. In doing research for this book I attempted to speak with many of my colleagues who learned the original version of Koryo, both here and in Korea, but many have passed away. I told those who remain of my intentions to preserve Original Koryo through this new book for the benefit of future generations of taekwondo men and women. MDC: For me, our new book represents a dream come true. I was first introduced to Grandmaster Chun's literary work as a color belt. After immersing myself in Advancing in Taekwondo, I subsequently read everything he wrote from cover to cover. To be sharing in the creation and publication of Taekwondo Black Belt Poomsae: Original Koryo and Koryo and the DVD, Taekwondo Black Belt: Koryo and Original Koryo is an honor. It is an important contribution to the legacy of taekwondo. I hope it is well accepted and used as a reference guide for many years to come. What roles do you see each of you playing in the future proliferation of traditional taekwondo and where, do you feel, taekwondo is headed in the future? GMRC: I regularly hear from so many advanced black belts – Americans, Latinos, Europeans – many who have lost their original masters and have nowhere to turn when they have questions or problems. So I get many inquiries from these people. I am so happy to help them by providing technical direction or advice concerning their taekwondo training and their lives in general. As a senior taekwondo master I feel it is my obligation to act in this way. I will continue to try to help these people. I also plan on developing advanced self-defense techniques, as I have over the past few years, for the benefit of my advanced students and to continue writing. This is how I plan to move ahead in the world of taekwondo. MDC: I can only hope to follow in the footsteps of my mentor, Grandmaster Chun. Beyond that, it is my sincere hope that taekwondo will not share the fate of judo where unbridled competition virtually destroyed the heart of the art. It is important that we view our discipline as the priceless inheritance that it is while maintaining and cherishing the traditional aspects of the art in dojangs around the world.